Ask fellow campers about "Interstate Campground" and nearby attractions. There are several campsites, back to back, with 30 amp electric service and water. While there is no WiFi regular reception for Hot Spots was strong. There is a laundry room with 2 washers and 1 dryer - good price: $1.25. There is a swimming pool but the water was green and not open. There is a camp store with quite a selection of junk food. This is a nice place to stop on the road if tired for the day, but not a destination as such... not bad for the money. Not much to do here for Labor Day weekend - no sidewalks or paths for hiking, and roads too narrow to ride bicycles. No events noticed in either Marion or Chilhowie (the 2 nearest towns). Used the time to clean the inside of the rig (bathroom and floor), defrost the frig, transfer fotos from the cell to the computer, and played games on the computer... nothing else to do... We camped at Interstate Campground in a Motorhome. Convenient place for an overnight when traveling I-81. Most sites seem to have 30 amp only. They are really 2 backing sites end to end. It would have to be fairly empty to be able to pull thru. Pay internet is available through Xfinity at $7 per day. Verizon cell service is very strong so we used that. Mostly clear of trees so satellite works well. May have some power issues as the 5th wheel next to us was plugged into our outlet with a long extension. Since nomone was home, I moved his connection to his pedestal and used our marked outlet. We camped at Interstate Campground in a Motorhome. As the name indicates it is on the interstate. The owner was friendly and helpful. Our site was at the entrance, paved and level. Very noisy due to the road noise. It is a double row of about 8 spots each row between rows of apartments. There is a bathhouse but no amenities at all. We were here 3 nights while enjoying the creeper trail. This is a great place if staying a night or 2, but not a destination place. We camped at Interstate Campground in a Motorhome. Ride the creeper trail. You can bring your own bike or rent one. Beautiful scenery and lots of fun. We had a great night sleep. Didn't hear the interstate noise, but there is a train that comes by. It is a small place between an assisted living and motel units. The drive throughs were even, hot topped, I would recommend this place in a heartbeat. We will stay here again when passing through. Glad they has a place for us. We camped at Interstate Campground in a Motorhome. As the name suggests, this is just off of Interstate 81, but despite that it was fairly quiet, thanks to a low hill between the campground and the highway. It's just a group of fairly close-spaced, but paved, sites nestled among motel units, but more than adequate for an overnight. Restrooms were old, but reasonably clean, and at only $20 a night for a full hookup - water, sewer, and electric - I definitely plan on using this campsite again. 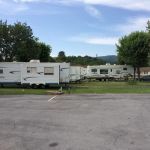 It's closer to the highway than the nearby Hungry Mother State Park, which was full because of Labor Day weekend, so it's good for one-night stays when traveling through the area. Pleasant, friendly receptionist at the desk. We camped at Interstate Campground in a Motorhome. Are you affiliated with Interstate Campground ?